“Last year and this year I think we did believe that [they were choke artists]. Three years ago we didn’t because they smoked everybody, and I think we all thought they were going to win it all. Unfortunately that didn’t happen. Now, bear with me, I don’t think Hamels was being completely arrogant here. 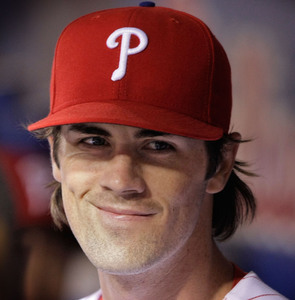 I do think Hamels and the other Phillies thought the Mets were able to defeat everyone in 2006. And they were. They came excruciatingly close to winning the National League Championship Series; instead, the Cardinals defeated them, and they took care of an overmatched, green Detroit Tigers team. Really, that season was the Mets’ to lose, and they absolutely lost it. 2007, of course, was theirs to lose, as well. They should’ve won the East. They didn’t. Last year, however, seemed a bit different. Though the Mets had a sizable lead on the Phillies in September, it never seemed out of reach. By 2008, the Mets had become almost a running joke. Yes, while Hamels said something that will make him vilified beyond belief, it really isn’t far from the truth. And he absolutely believes that.